Facing a barrage of allegations of anonymity property and later being raided by the Income Tax Department, Rashtriya Janata Dal (RJD) supremo Lalu Prasad Yadav lashed out at Bharatiya Janata Party (BJP) and the Central Government asserting that the saffron party and Rashtriya Swayamsevak Sangh (RSS) are holding grudges against him and his party for which they would soon repay. "BJP, RSS people should listen, and know that Lalu Yadav will drag you off your seat in Delhi, whatever be my situation. BJP and RSS are holding grudges against me for which they would pay. They are doing this to project a bad image of me and my party," Yadav told ANI. Further lashing out at the Modi government, Yadav said a rally will be held to fight against BJP and also to decide future course of action. "Modi's government will not be able to complete five years, if they continue with this behaviour. A rally will take place in Gandhi Maidan on August 27, invited leaders of similar ideologies to decide future course of action," said Yadav. Earlier this month, raids were conducted by the Income Tax (IT) department at the 22 locations in Delhi, Gurugram on companies and people associated with Lalu. A team of about 100 tax department officials and police personnel reportedly carried out the raids. As per sources, the raids were conducted on the charges of illegal (benami) land deals worth Rs. 1,000 crores. Lalu's advocate Chitranjan Sinha, however, denied the allegations, saying that the RJD chief doesn't even have 22 residences in Delhi. The RJD supremo also refuted the charges asserting that he is not afraid of the onslaught against him. Lalu took to his Twitter page to slam the Bharatiya Janata Party (BJP), saying the saffron party and Rashtriya Swayamsevak Sangh (RSS) are trying to pressurise him, knowing that he will expose their "lies, loot and jumlas." Challenging the Centre to reveal the names of the 22 places raided, the former Bihar chief minister said, "At least tell which 22 places were raided, you illiterates. 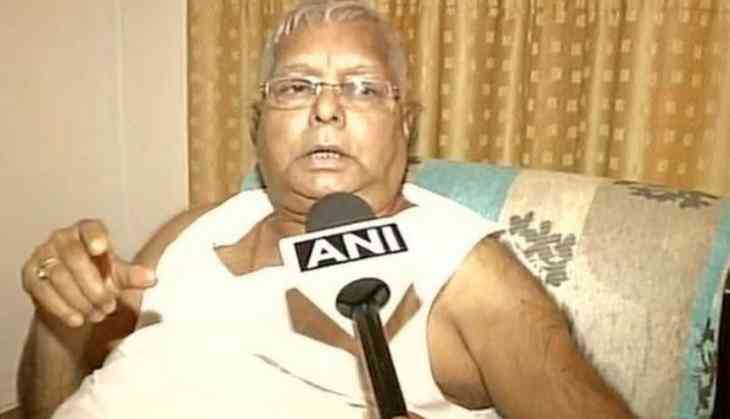 Lalu is not scared of BJP-backed media and government puppets." Reacting to the RJD chief's assertion, the Centre said that if Lalu is innocent, then he should prove it to the IT department. "The raids are being conducted as per procedure. We have no intention to intimidate anyone. There have been reports of the massive property owned by his son and daughter in both Bihar and Delhi. Why has there been no clarification? A profit worth 1000 crores is questionable, and hence he is under the scanner," Union Law Minister Ravi Shankar Prasad told ANI.